You can’t truly understand everything about a business in 1 week. It took me 10 years and I am still learning new things about BYD. It is a continuous learning process. You could spend a lifetime studying a business or industry, but in a few seconds I can tell you whether or not I like it. You want to build [knowledge and continually learn]. There is not set preparation. Kyle: When you think about what Reinhart and Rogoff’s book says, it kind of gets to an answer but it’s not the right way to look at things; there are many more variables to analyze the situation with. One is, of course, debt to central government tax revenues—that ratio. Another one is what percentage of your central government tax revenues do you spend on interest alone? Those barometers are much more impactful than just using a debt-to-GDP barometer. And then when you think about Reinhart and Rogoff’s work, if you’ve read all the white papers that they’ve written prior to writing the book, one of the other conclusions that they draw is when debt gets to be about 100% GDP it becomes problematic. Well, what that means is, typically—and, again, painting the world with a broad brush—central government tax revenues are roughly 20% of GDP. So what they’re telling you is when debt gets to be 5 times your revenue, that’s when you start to have a problem. Historically, the analysis that’s been done empirically by academics has focused on the countries that have fallen into a restructuring or a default as a result of this ratio that you and I are discussing. Historically, those have been emerging market economies that have higher borrowing costs. So, it actually makes complete sense that that number is too low when you’re talking about a developed market economy versus an emerging economy because, in theory, a developed economy can borrow at lower rates than an emerging economy can. That being said, in Japan, when the debts are 24 times their central government tax revenue, they are already completely insolvent—it’s just a question of when does it blow up. 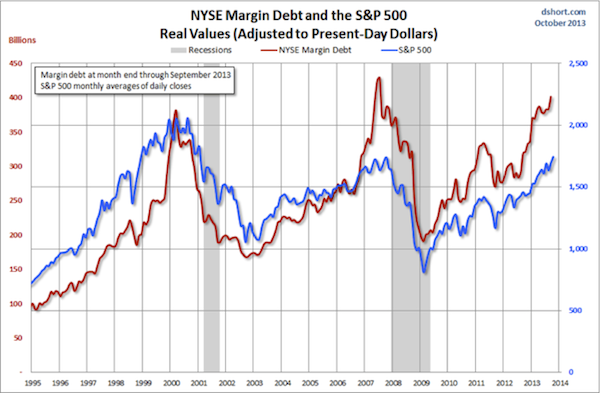 NYSE margin debt is showing the kind of rapid acceleration that often signals a draw down in the S&P 500. Are we there yet? Maybe not, as the level of investor complacency is just so (insert your favorite expletive) high. The potential for bubbles building atop the monetary largesse being poured into our collective glasses is growing. As an example, the "high-yield" bond market is now huge. A study by Russell, a consultancy, estimated its total size at $1.7 trillion. These are supposed to be bonds,the sort of thing that produces safe income for retirees, yet almost half of all the corporate bonds rated by Standard & Poor's are once again classed as speculative, a polite term for junk. Rather, the crisis ended – and in hindsight, ended precisely – on March 16, 2009, when the Financial Accounting Standards Board abandoned mark-to-market rules, in response to Congressional pressure by the House Committee on Financial Services on March 12, 2009. The decision by the FASB gave banks “substantial discretion” in the values that they assigned to assets. With that discretion, banks could use cash-flow models (“mark-to-model”) or other methods (“mark-to-unicorn”). Importantly, the impact of the FAS 157 change is easier to appreciate in hindsight than it was in the fog of war. Its success relied on regulators to go along with the new numbers, and bank depositors and customers to believe them. I've frequently discussed our own response to the crisis, which was to insist that our methods to estimate market return/and risk were robust to Depression-era outcomes (even though our existing methods had anticipated the crisis and performed admirably during the market collapse). It's no secret that we missed returns in the interim as a result. We are evidence-driven investors, and similar economic and financial disruptions were simply out of context from the standpoint of post-war evidence. Nevertheless, it's critical to go back and understand the actual mechanism that ended the crisis, so that we as investors don't allow ourselves to be misled into an increasingly false sense of security about Federal Reserve actions. It's probably also worth observing how heavily banks have relied on the release of "loan loss reserves" in order to beat earnings estimates in recent periods. A couple of things on Scott Adams (the creator of "Dilbert") and his new book. I'm a bit late getting to this, but thanks to those who passed the link along. The first signs of a new Ajit Jain came at the January 2012 renewals, when the potential heir to Buffett played big on Australasian cat and international retro. Jain took a large share of the IAG property cat treaty that had handed painful losses on to the pre-existing markets. It looked like classic Jain: hundreds of millions of dollars of capacity thrown at the feet of a cedant that was struggling for capacity. In hindsight, it became clear that it was the first in a series of mammoth cat and multi-line deals with cedants from Asia Pacific. IAG was followed by a hefty (and uncapped) retro quota share for Asia Capital Re; next came some aggressive Japanese quake pro rata deals and a gargantuan quota share with Toa Re. After Berkshire Hathaway made its presence felt during the Indian renewals, the New Zealand Earthquake Commission (EQC) was next as the reinsurer came from a standing start to write a NZ$500mn line to help the programme expand substantially. By far the most prominent deal in Jain's Asia Pacific push was made with loss-hit Australasian cedant Suncorp. Berkshire ramped its line on the main programme up to around $800mn, hoovered up the entire New Zealand buy-down protection and wrote a $300mn-premium quota share of Suncorp's Queensland homeowners' book. It is believed all of this was written for a three-year period. And this agreement overshadowed a multi-year deal with Berkshire that took the whole of New Zealand insurer AMI's NZ$1.4bn cat programme out of the market, denying resentful loss-paying markets the chance to earn their payback. At the beginning of 2013 Berkshire filled in the final piece of its Australasian strategy by striking a deal with QBE to write 15 percent shares of a range of its programmes, including the company's $1.3bn global cat treaty and its global aggregate cover. All in all, Berkshire Hathaway is thought to have swollen its Asia Pacific writing by between $1.5bn and $2bn in this period of frenzied activity, with most of this coming through multi-line uncapped quota shares or cat excess-of-loss business. The phenomenon I will call the Stiglitz syndrome, after an academic economist of the so-called “intelligent” variety called Joseph Stiglitz, is as follows. Remember the fragility detection in Chapter 19 and my obsession with Fannie Mae. Luckily, I had some skin in the game for my opinions, be it through exposure to a smear campaign. And, in 2008, no surprise, Fannie Mae went bust, I repeat, costing the U.S. taxpayer hundreds of billions (and counting)—generally, the financial system, with similar risks, exploded. The entire banking system had similar exposures. But around the same period, Joseph Stiglitz, with two colleagues, the Orszag brothers (Peter and Jonathan), looked at the very same Fannie Mae. They assessed, in a report, that “on the basis of historical experience, the risk to the government from a potential default on GSE debt is effectively zero.” Supposedly, they ran simulations—but didn’t see the obvious. They also said that the probability of a default was found to be “so small that it is difficult to detect.” It is statements like these and, to me, only statements like these (intellectual hubris and the illusion of understanding of rare events) that caused the buildup of these exposures to rare events in the economy. This is the Black Swan problem that I was fighting. This is Fukushima. Now the culmination is that Stiglitz writes in 2010 in his I-told-you-so book that he claims to have “predicted” the crisis that started in 2007–2008. Look at this aberrant case of antifragility provided to Stiglitz and his colleagues by society. It turns out that Stiglitz was not just a nonpredictor (by my standards) but was also part of the problem that caused the events, these accumulations of exposures to small probabilities. But he did not notice it! An academic is not designed to remember his opinions because he doesn’t have anything at risk from them. At the core, people are dangerous when they have that strange skill that allows their papers to be published in journals but decreases their understanding of risk. So the very same economist who caused the problem then postdicted the crisis, and then became a theorist on what happened. No wonder we will have larger crises. The central point: had Stiglitz been a businessman with his own money on the line, he would have blown up, terminated. Or had he been in nature, his genes would have been made extinct—so people with such misunderstanding of probability would eventually disappear from our DNA. What I found nauseating was the government hiring one of his coauthors. I am reluctantly calling the syndrome by Stiglitz’s name because I find him the smartest of economists, one with the most developed intellect for things on paper—except that he has no clue about the fragility of systems. And Stiglitz symbolizes harmful misunderstanding of small probabilities by the economics establishment. It is a severe disease, one that explains why economists will blow us up again. The Stiglitz syndrome corresponds to a form of cherry-picking, the nastiest variety because the perpetrator is not aware of what he is doing. It is a situation in which someone doesn’t just fail to detect a hazard but contributes to its cause while ending up convincing himself—and sometimes others—of the opposite, namely, that he predicted it and warned against it. It corresponds to a combination of remarkable analytical skills, blindness to fragility, selective memory, and absence of skin in the game. There are other lessons here, related to the absence of penalty. This is an illustration of the academics-who-write-papers-and-talk syndrome in its greatest severity (unless, as we will see, they have their soul in it). So many academics propose something in one paper, then the opposite in another paper, without penalty to themselves from having been wrong in the first paper since there is a need only for consistency within a single paper, not across one’s career. This would be fine, as someone may evolve and contradict earlier beliefs, but then the earlier “result” should be withdrawn from circulation and superseded with a new one—with books, the new edition supersedes the preceding one. This absence of penalty makes them antifragile at the expense of the society that accepts the “rigor” of their results. Further, I am not doubting Stiglitz’s sincerity, or some weak form of sincerity: I believe he genuinely thinks he predicted the financial crisis, so let me rephrase the problem: the problem with people who do not incur harm is that they can cherry-pick from statements they’ve made in the past, many of them contradictory, and end up convincing themselves of their intellectual lucidity on the way to the World Economic Forum at Davos. There is the iatrogenics of the medical charlatan and snake oil salesperson causing harm, but he sort of knows it and lies low after he is caught. And there is a far more vicious form of iatrogenics by experts who use their more acceptable status to claim later that they warned of harm. As these did not know they were causing iatrogenics, they cure iatrogenics with iatrogenics. Then things explode. The Fed’s capabilities to engineer changes in economic growth and inflation are asymmetric. It has been historically documented that central bank tools are well suited to fight excess demand and rampant inflation. The Fed showed great resolve in containing the fast price increases in the aftermath of World Wars I and II and the Korean War. Later, in the late 1970s and early 1980s, rampant inflation was brought under control by a determined and persistent Federal Reserve. However, when an economy is excessively over-indebted and disinflationary factors have forced central banks to make overnight interest rates as close to zero as possible, central bank policy has repeatedly proved powerless to further move inflation or growth metrics. The periods between 1927 and 1939 in the U.S. (and elsewhere) and from 1989 to the present in Japan are clear examples of the impotence of central bank policy actions during periods of over-indebtedness. Four considerations suggest the Fed will continue to be unsuccessful in engineering stronger growth and higher inflation with their continuation of the current program of Large Scale Asset Purchases (LSAP). First, the Fed’s forecasts have consistently been overly optimistic, indicating that their knowledge of how LSAP operates is flawed. LSAP obviously is not working in the way they had hoped, and they are unable to make needed course corrections. Second, debt levels in the U.S. are so excessive that monetary policy’s traditional transmission mechanism is defunct. Third, recent scholarly studies, all employing different rigorous analytical methods, indicate LSAP is ineffective.Fourth, declining velocity deprives the Fed of the ability to have a measurable influence on aggregate economic activity and is an alternative way of confirming the validity of the aforementioned academic studies. Thanks to Jim for passing this along. In our third quarter letter you will find an update on our portfolio and general market observations. Each quarter we highlight one component of our investment process. This quarter, in the section titled The Architecture of Reason, I will discuss a framework of rational decision-making and how we attempt to apply it using our seventy-two-point investment checklist. Warren and the Howards were on Piers Morgan last night. This is one clip of many. As of now, a few more can be accessed from HERE. Hussman Weekly Market Comment: Did Monetary Policy Cause the Recovery? As investors, we should be aware that the current Shiller P/E of 24.8 (S&P 500 divided by the 10-year average of inflation adjusted earnings) is now above every historical instance prior to the bubble period since the late-1990's, save for the final weeks approaching the 1929 peak. We should also be aware that overvaluation alone in the late-1990’s did not stop the market from reaching even higher levels as new-era speculation culminated in the 2000 bubble peak. It’s fine, and quite accurate to say that valuations are not as frenzied as they were at the 2000 extreme (a comparison that fell from the lips of Robert Shiller himself last week), provided that one also recognizes that the hypervaluation in 2000 has been followed by a period that included two separate market losses in excess of 50%, and a nominal total return from 2000 until today averaging just 3.2% annually. Even that weak 13-year return has been achieved only thanks to distortions that have again driven present valuations to temporary and historically untenable extremes. Put simply, the past 13 years have chronicled the journey of valuations - from hypervaluation to levels that still exceed every pre-bubble precedent other than a few weeks in 1929. If by 2023, stock valuations complete this journey not by moving to undervaluation, but simply by touching pre-bubble norms, we estimate that the S&P 500 will have achieved a nominal total return of only about 2.6% annually between now and then. We believe that it is easier to be patient with an investment holding that declines in price when one intimately understands the investment holding. From that perspective, we want to give you our detailed investment thesis on Strayer so you can better understand why we continue to allocate a large percentage of the portfolio to this investment. And if anyone has gone to Strayer or knows people who have gone there, teach there or work there, send me and email (valueinvestingworld@gmail.com), as I'd love to get more information from people involved with Strayer. Thanks. "If financial speculation were pushing all prices above the level consistent with the fundamentals of supply and demand, we would expect inventories of crude oil and petroleum products to increase as supply rose and demand fell. But, in fact, available data on oil inventories shows notable declines over the past year." “Speculation… is increasingly affecting the price,” he said. “The price has this parabolic shape which is characteristic of bubbles,” he said. Oct. 16 (Bloomberg) -- James Grant, publisher of Grant's Interest Rate Observer, talks about the impact of the fiscal impasse in Washington on global markets, U.S. debt and the dollar, and the outlook for Federal Reserve policy. Grant speaks with Deirdre Bolton on Bloomberg Television's "Money Moves." Tracy Britt Cool, Warren Buffett‘s financial assistant at Berkshire Hathaway, says she was already familiar with the billionaire’s investing style when she joined the company in 2009, but working by his side for the past four years has given her a new appreciation for Mr. Buffett’s hands-off management style. The big lesson, Ms. Cool said, was learning “how much you can get out of people when you… give them space.” Speaking at Fortune magazine’s Most Powerful Women conference in Washington, DC on Wednesday, the 29-year-old Harvard MBA said Mr. Buffett gives his managers “freedom and flexibility” to run their businesses as they see fit, even when he doesn’t agree with them. As the chairwoman of four Berkshire-owned companies including paints maker Benjamin Moore, Ms. Cool said she spends a lot of her time “getting smarter about ways to help Berkshire,” especially in terms of helping improve operations and eventually, make acquisitions. Fantastic, everybody made some good money in the past 18 months thanks to the Fed’s aggressive monetary policy — or, to be specific Twist, QE3, and QE4 — which dropped mortgage rates from 5.5% to sub 3.5% almost overnight in late 2011. This made it so everybody could instantly “afford” 20% more house. Over the next year this increase in “purchasing power” pushed house ‘prices” higher. Throw in top aggressive Wall Street and private all-cash “investors” regularly paying 10% to 20% over appraised value / list price for their buy-to-flip/rent schemes and viola’…everybody who owns a home is a lot more “wealthy” — on paper — than 18 months ago. This note is to throw out some compelling data on where housing actually sits relative to the bubbly years. And that although it may look different, conditions may be quite similar. Greed and fear, as they relate to financial assets and decision making, are powerful emotions. When you see them driving markets, step back, breathe, have a drink, and a think. Buffett on JC Penney's future "Coming from behind in retailing is just plain tough." Link to: What Happens When You Don’t Buy Quality? And What Happens When You Do? Although it isn’t unprecedented for Mr. Buffett to replace top executives, they typically leave only when they retire. Mr. Buffett, who declined to comment, has said that no manager of a significant Berkshire business has left voluntarily to join a competitor. There has been more churn than usual at the subsidiaries lately. Last week, paint company Benjamin Moore named retail-industry veteran Michael Searles as CEO, the third person to occupy the post in two years. Jewelry retailer Borsheims also named a new CEO last week after Susan Jacques, who had led the company since 1994, left for the top position at the Gemological Institute of America, a nonprofit. At a May gathering of Berkshire CEOs with Mr. Buffett ahead of the company’s annual meeting, some managers asked him what their responsibility was after he was no longer at the company, according to people present. Mr. Buffett encouraged them to preserve Berkshire’s culture of autonomy, one person said. People familiar with Mr. Buffett’s thinking said the investor believes that Berkshire managers are loyal to the company and not to him personally. Still, he has acknowledged that despite his efforts to preserve Berkshire’s culture for the future, things will change. Over history, and including the past decade, properly normalized valuations have remained a powerful guidepost for full-cycle and long-term returns, particularly on the horizon of 7-10 years. On that front, the current price/revenue multiple of the S&P 500 of 1.54 is now nearly double the historical norm prior to the late-1990’s bubble. The same is true for other useful metrics such as the market value of nonfinancial stocks to nominal GDP (based on Z.1 flow of funds data). With our broadest estimate of prospective S&P 500 10-year nominal total returns down to just 2.9% annually, 10-year Treasury bond yields at 2.7%, Treasury bill yields pinned at zero, and state and corporate pension assumptions still in the range of 7-8% annually, it appears quite likely that the coming decade will produce a widespread pension funding crisis in the U.S. Meanwhile, the current Shiller P/E (S&P 500 divided by the 10-year average of inflation-adjusted earnings) of 24.2 is closer to 65% above its pre-bubble median. Despite the 10-year averaging, Shiller earnings – the denominator of the Shiller P/E – are currently 6.4% of S&P 500 revenues, compared to a pre-bubble norm of only about 5.4%. So contrary to the assertion that Shiller earnings are somehow understated due to the brief plunge in earnings during the credit crisis, the opposite is actually true. If anything, Shiller earnings have benefited from recently elevated margins, and the Shiller P/E presently understates the extent of market overvaluation. 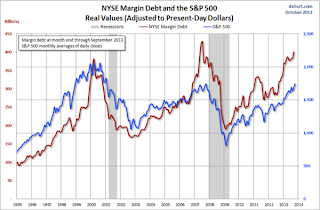 On historically normal profit margins, the Shiller P/E would be about 29 here. In any event, on the basis of valuation measures that are actually well-correlated with subsequent market returns, current valuations are now at or beyond the most extreme points in a century of market history, save for the final approach to the 2000 peak. Of course, valuations exert far more effect on long-term returns than on short-term outcomes, where a much larger set of considerations generally apply. Unfortunately, on shorter horizons, the past few years have been unusual. Market conditions that have historically resulted in awful losses over the intermediate-term have instead been associated with positive returns. In this week's letter, though, we are going to talk about a different type of energy and a story that I find enormously positive. Three items have come across my screen in the past month that, taken together, truly do signal a major turning point in how energy is discovered, transported, and transformed. And while we'll start with a story that most of us are somewhat aware of, there is an even larger transformation happening that I think argues against the negative research that has come out in the last few years about the reduced potential for growth in the world economy. How fragile we are. Five years on from the Lehman Brothers collapse, political and regulatory errors have made the world’s financial system even more fragile. This alarming line of thought comes from Nassim Nicholas Taleb, best known for The Black Swan, which explained markets’ difficulties in pricing extreme events for which they had no precedent. Mr Taleb, who spoke to me in London last week, divides opinion. For some he is a genius, for others a charlatan. What seems clear, however, is that his gloriously charismatic act and polymath choice of imagery, drawn from philosophy, mathematics and the Classics, can get in the way of underlying ideas which are not in fact far-fetched. Indeed they contain a hard kernel of commonsense truth. Here, then, is an attempt to render Mr Taleb’s poetic arguments in prose. Those wishing to see the man in action can watch the videos on FT.com. [For a third rule] I’d say, look for companies that have optionality….Optionality means to have more upside than downside because the company has options. An “option” in this sense acts like a financial option, and a financial option is an instrument of antifragility because you pay a premium and you have all this upside and very little downside. The companies make more from the upside of something than from the downside. Make sure the optionality is not priced by the market. And of course, go away from companies that have negative optionality. An optionality that is priced in the market is, for example, buying energy companies and gold companies before a rally in gold. Instead ofinvesting in gold, people invested in companies that made a lot more than gold. But after a while, this got priced in. In other words, if you’re wrong on gold, you do a lot better than those who invested in gold outright. If you’re right on gold, you do a lot better than those who invested in gold. You have to avoid the lottery-ticket effect of investing in companies that are overpriced because people are looking at the big upside. I love learning about history, especially the history of innovation. I recently got to write the foreword for Edison and the Rise of Innovation, a new book about one of the great inventors ever. I thought I would share the foreword with you, along with a few photos of some of the Edison-related items I’m lucky enough to own. The Apollo Asia Fund's NAV fell 0.8% in the third quarter, to US$1,896.80. Over the last twelve months it was up 9.3%. Despite a 5% retreat in NAV from the peak in May, the estimated current-year PE of the fund at the end of September was 15.6, still relatively high by the fund's own historical standards. Moreover, some of the high-quality, cash-generative consumer stocks which have stood us in good stead in the past are now priced for ongoing high growth which we doubt they will be able to deliver, and many of the stocks less highly rated are discounted for good reason. Stock selection currently seems quite challenging. Moreover, a growing proportion of our attention goes to monitoring (and trimming) our existing holdings, many of which seem to be finding their own businesses equally challenging. There must be beneficiaries of this somewhere. Individual lawyers, regulators, and fixers are hard to invest in. Some IT companies, conference organisers, printing companies and hotels may benefit - but these are not particularly promising sectors for a fund such as ours. The companies we like are those which have continued ability to grow and a clear plan of action which we believe they will be able to implement steadily, adjusting to inevitable gusts, but able to maintain a steady course even in changing circumstances. Any well-run company of this type is one that we would like to have on the radar screen, as analysis often takes us months; we can then be in a position to buy when valuations are fair or better. We have a number of these, and have added one new one recently. We have many more candidates on the watchlist or yet to research, but are always happy to hear of more. This is a market where you need to be very careful not to “take” market share at rates that are unsustainable. The funny thing about focusing on one dimensional goals, like market share gains, is that you will get two dimensional results, one of which you've decided doesn't warrant any prospective consideration (i.e. market share gains without regard to sustainable profitability). Ours is a business where you need to have two dimensional success. As we've noted before, in a service business like logistics, gaining market share isn't nearly as important as gaining profitable market share. To us, this is the difference between “taking market share” and having market share “take you.” We'd prefer not to be “taken.” We think our shareholders would agree. Giving the shareholders' money to potential customers to induce them to move freight through our Expeditors network seems somewhat counter-productive…let alone a breach of our fiduciary responsibility and moral obligation to make money for those same shareholders.